Joe Soong wrote an article on AlhambraSource.Org regarding Los Angeles County’s Chinese restaurant’s public health ratings. As much of a borderline germaphobe as I am. When it comes to good food, if the food ain’t spoiled, spit on, dropped on the floor or wrapped with a dirty cloth, I don’t care much, bring it to me. From what I’ve read, the Health Department picks on many aspects of the restaurant, not just the food. So in some ways, a restaurant can cook the best food, but still have a “C” rating if their dish washing detergent is too close to the food areas, or the temperature of the gravy is a degree off, etc. Main point is, thje rating does not indicate the quality of the food, but the quality of the kitchen, which CAN be an issue, just not necessarily on your visit. Please go HERE: http://www.alhambrasource.org/stories/aamericanized-bbetter-cchinese-abcs-san-gabriel-valley-chinese-restaurants for the original article. As a Chinese-American who happens to have many non-Chinese friends, I have been asked many times for recommendations to Chinese restaurants. To help, I have created a tutorial in how to determine if an establishment is a legitimate purveyor of genuine Chinese cuisine. “A” = Americanized. This is the least desirable rating, where the food establishment focuses too much on superficial attributes such as cleanliness and proper food temperatures. Instead of real Chinese food, it features mundane Americanized entrees such as sweet and sour pork and egg rolls. A real Chinese restaurant does not proudly display an “A” rating. “C” =Chinese. Real, homegrown Chinese food is served at this establishment. You won’t find reviews for these restaurants on the local TV news. 1. The restaurant clientele must be minimally 95 percent Chinese and they will be speaking any one of the numerous Chinese dialects. Don’t worry about feeling out of place. Most patrons will be focused on their food and not on who walks in through the front door. 2. A real Chinese restaurant uses circular tables that can crowd up to 12 people at each table. If you’ve been to a Chinese wedding, you know what I mean. To guarantee equal access for all, the entrees are placed on the round, rotating Lazy Susan in the center of the table. In contrast, many Americanized Chinese restaurants have long rectangular tables for larger groups. This works well if everyone orders their own entrée (non-Chinese style) or if you don’t mind being bothered by repeated, constant requests to pass entrées around to everyone else. In inauthentic Chinese restaurants, the wait staff will make pleasant small talk and will periodically check up on you to see how you are doing. This may not be the case in a real Chinese restaurant. So, if you don’t see your waitress again until it’s time for the check, don’t worry, it’s not personal. 3. The wait staff will not be native English speakers and may have difficulty communicating with you. This is a positive sign because it indicates the waiters and waitress were hired to serve a primarily Chinese clientele and the restaurant most likely prepares the food accordingly. In other words, you will be served real Chinese food. On the down side, because of the language barrier, there is a high likelihood that at least one of your entrees will be a dish you did not order. Enjoy the braised pork spleen. 4. 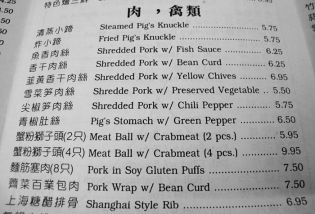 In a restaurant serving true Chinese food, the menu almost seems to be an afterthought, which is a good thing. This means that the food establishment did not spend too much time on it, primarily focusing its efforts on the food. The menu will be a minimal affair, most likely composed of simple, laminated, and possibly food-stained Xerox copies. If the menu resembles a wedding album with a fancy cover, pictures, and possibly designed by a graphic artist, then the restaurant is probably not authentic. In a real Chinese restaurant, the menu was probably created by the same person who hired the wait staff, ordered the vegetables from the wholesaler, and who looked at you like you were an idiot when you asked him if he could take the chicken out of the Kung Pao Chicken because you are a vegetarian. Remember, in a real Chinese restaurant, the customer is right only some of the time. This recipe is very forgiving, use as much mushrooms, whatever kind you want, add as much scallops as you like, large or small, seared or just plain, scallops and mushrooms goes well together…just be sure not to over salt, over sauce or over cooked the scallops. Taste test before you serve! I often cook the dishes my parents made for me growing up. I decided to make a video of this one. It’s very light and healthy. This ain’t Panda Express’s Chinese food so if you are an “unadventurous” eater. Go have a salad.